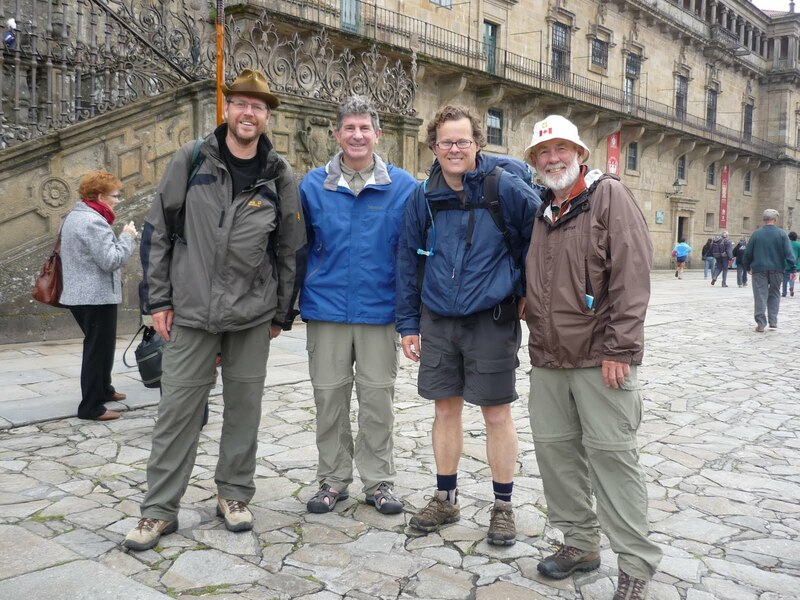 Hyping the Camino: What a Difference a Day Makes! Our second morning in Santiago was warm and wonderful and full of fun and couldn´t have been more drastically different than our dismal and dreary arrival the day before. After an unhurried breakfast, at 9:30am, we walked the 50 steps from our hotel to the major square in front of the cathedral and started taking pictures and greeting people as they arrived. John was the first and then there was just a steady stream of those with whom we had walked all along our camino. We seemed to have met everyone - Wayne and Andre from Quebec, Emilio from Spain, Ingelise from Denmark, Jill from California and the Camino documentary the camera crew that was tracking her and others, Liane and Jurgen from Germany, Bruce from Vancouver, Anne from Boston, Son and James from Korea and Martin from Germany. Martin was the first person we met in Orisson at the start of our pilgrimmage but he walks fast and he left us behind early on. We met up with him in the cathedral and we all went out for café con leches before the noon hour pilgrims´mass. It was especially neat to see how emotional some pilgrims were to receive communion at this mass. One woman was sobbing as she returned to her seat. At the same time, I was elbowed out of the communion line by those who wanted to get to communion faster. Imagine! A Korean priest, who had just finished his camino, assisted with the mass and another pilgrim sang two songs, one Ave Maria just as mass finished. Absolutely amazing. The afternoon was spent in the garden plaza right outside our hotel which turned out to be a prime spot because everyone passed through there and stayed for a drink or two or three or for the afternoon. It was just a great afternoon and just how the camino should finish.